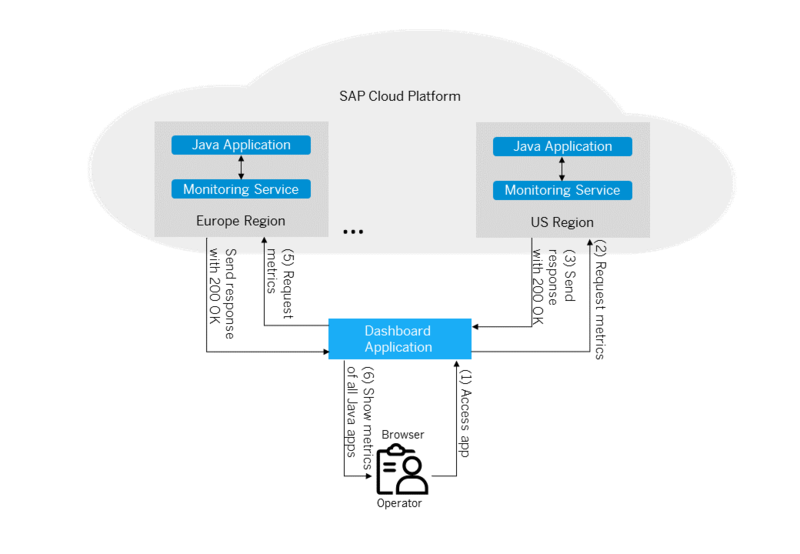 You can use the monitoring service of SAP Cloud Platform to receive states and metrics of SAP Cloud Platform Java applications as well as of the applications’ processes. These Java applications can be in different SAP Cloud Platform subaccounts or even on different hosts (regions). For more information about the currently supported regions and their hosts, see Regions and Hosts. The only requirement is that your user is a member of the subaccounts that the Java applications are located in. For more information about how to check subaccount memberships, see Managing Members in the Neo Environment. To achieve this, you only need to develop a custom dashboard application that will display the metrics you need in the way you prefer. You can also use this application in your corporate network or in the SAP Cloud Platform network. Furthermore, you can choose your own UI technology for this dashboard application. For example, you can use SAPUI5 or SAP Fiori. An operator accesses a dashboard application in the web browser. The dashboard application requests metrics of a Java application from the monitoring service with a REST API call. For more information about the REST call, see Monitoring API. The monitoring service sends back a JSON response with a status code 200 OK. The response contains the state and metrics of the requested application. The dashboard application parses the JSON response and places the metrics in a list. The dashboard application requests the metrics of other Java applications by repeating steps 1 to 5. The dashboard application’s UI uses the list with metrics to display those metrics in the browser. app1 – an application created for a1 subaccount and used in the Europe (Rot/Germany) region. app2 – an application created for a2 subaccount and used in the US East (Ashburn/VA) region. This blog describes a scenario in which you retrieve metrics of Java applications running on SAP Cloud Platform. However, your scenario might also include components from other platforms such as on-premise systems, other cloud systems, or public services. In that case, you can extend the dashboard application or your company tool to show the necessary metrics for such a scenario. Nice blog for Metrics,very well explained.Could you please elaborate how can we do the metrics and monitoring for our on-premise system or any other cloud platform as you mentioned in the conclusion. ?I was exploring on it but could not find much information about it.Could you please share if you have some reference/link for it. The scenario that I describe is about getting metrics from apps on SAP Cloud Platform. If you use non-SAP apps or third-party systems, you need to contact them for such a configuration. In the conclusion, I mean that your company app can be extended to use SAP and non-SAP systems. I cannot tell how you will be able to monitor third-party cloud platforms. Is that your question exactly?